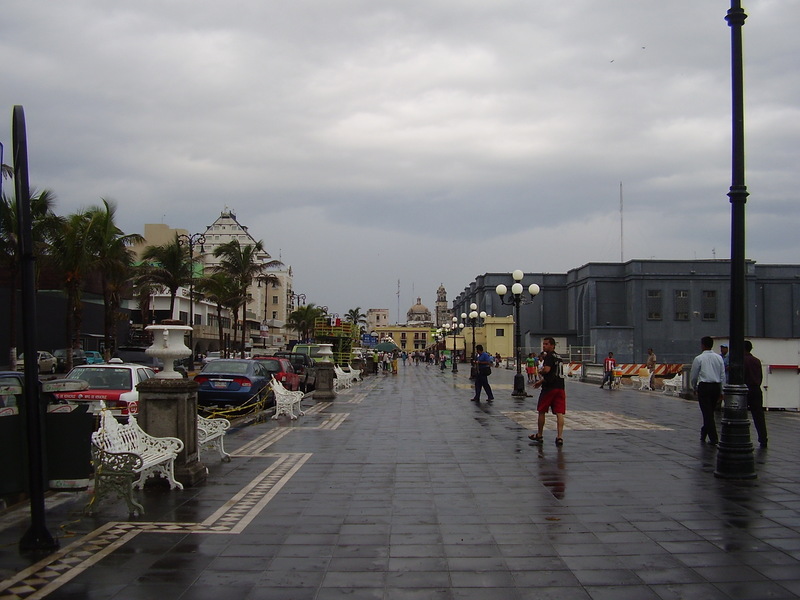 The state of Veracruz lies along the western shores of the Gulf of Mexico and the city of the same name, El Puerto de Veracruz (the port of Veracruz), has been the entry point into Mexico for centuries. We’re traveling through the state starting in the Puerto de Veracruz and then moving up into the cloud forested mountains at the state’s capital, Xalapa. Strategically located on the Gulf of Mexico, the Spanish conquistador Hernan Cortez conquered Mexico from it in 1519. The Americans invaded Mexico through it in 1846, the French in 1862. 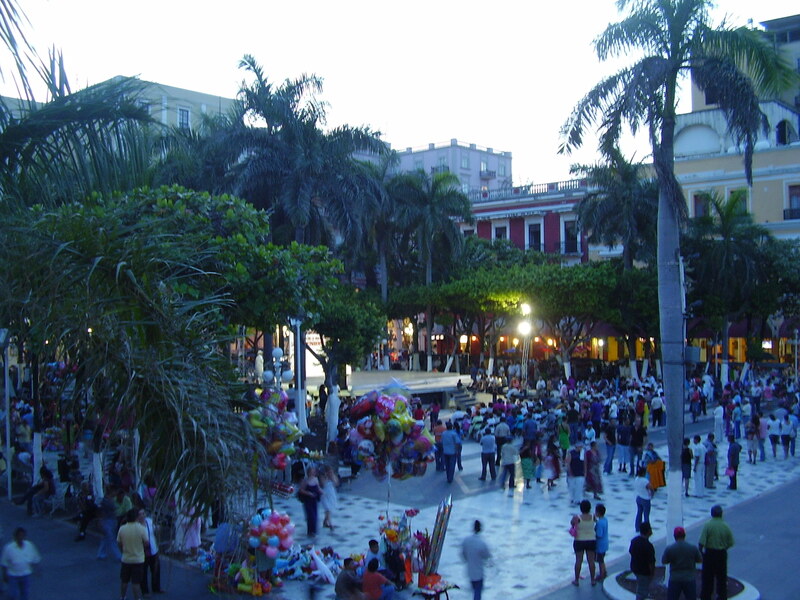 Yet despite its troubled past the port of Veracruz, and the state of the same name, remains a festive place enriched rather than diminished by the mix of cultures it has experienced over the centuries. Here you’ll find formally-dressed couples dancing the European, waltz-like Danzón, you’ll hear the Afro-Cuban rhythms of the son Jarocho (son ha-ROE-choe; the sound of Veracruz), bakeries make French-inspired bolillos (boh-LEE-yos; small baguettes), small towns in the hills make jamon serrano and longaniza (Spanish ham and sausage). We arrived in Veracruz in early September and immediately installed ourselves in the small but clean hotel El Faro near the Mexican Naval Academy for 350 pesos per night ($30) with an air-conditioned room. The street in front of the hotel ended in a circular plaza dominated by an obelisk commemorating the Veracruzanos that had died in the various wars that city has seen, one side devoted to the heroes of the Mexican-American War. 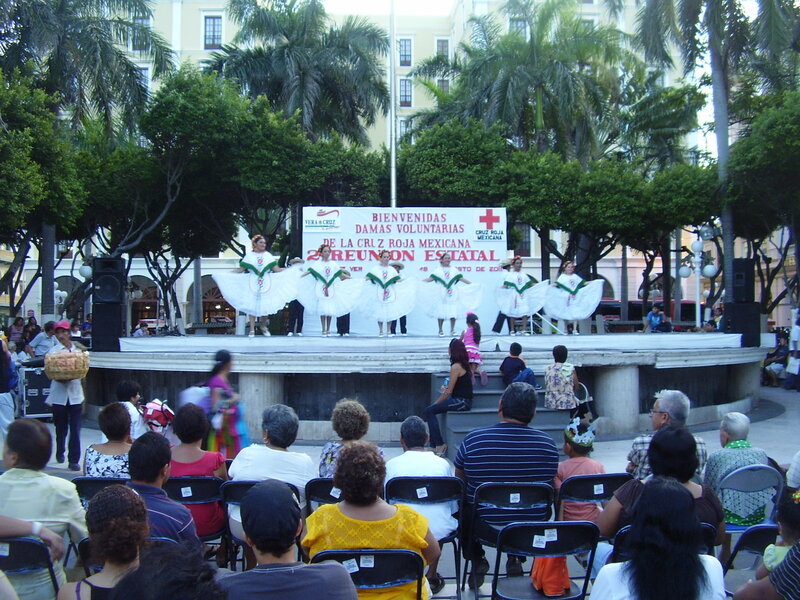 After a quick unpack, we walked the five blocks to the city’s main plaza, the Plaza del Constitución, where a free show featuring Veracruz dancers and musicians was going on. The dancers were great, effortlessly tapping out the fast rhythms from the harp plucking, guitar strumming trio on stage. After the show we ordered coffees in one of the open-air restaurants surrounding the plaza. I bought a small box of locally made San Andrés Tuxtla cigars from a street vendor and they were smooth, fresh and excellent. We walked back to our small hotel, well fed and ready to rest. After a breakfast of comida corrida (an inexpensive breakfast of eggs, beans, juice and a dessert of rice in sweetened milk – 30 pesos each) we walked down the concrete malecón (boardwalk) along the harbor. We saw a local tour trolley there and boarded it to the colonial Spanish fort of San Juan de Ulúa on the other side of the harbor. Built out of coral mined from the bay by the Spanish in 1565, the fort is enormous with warrens of cavernous prison cells, battlements, and a small town of administrative buildings, the whole fort penetrated down the middle by a canal leading to the harbor. We returned to our hotel for a siesta and as evening approached we walked back to the Plaza del Constitución. Tonight a salsa band had set up in the street and everyone was dancing, at least until the evening thunderstorm arrived. Everyone ran for cover as the heavy rain fell, but re-emerged a half hour later to resume dancing as the storm moved on. We finished the night at our now favorite street-side café, El Gran Café, and retired for the night. Time to explore around the city so we walked to the aquarium. It was surprisingly good with deep water displays and a tank full of manatees. 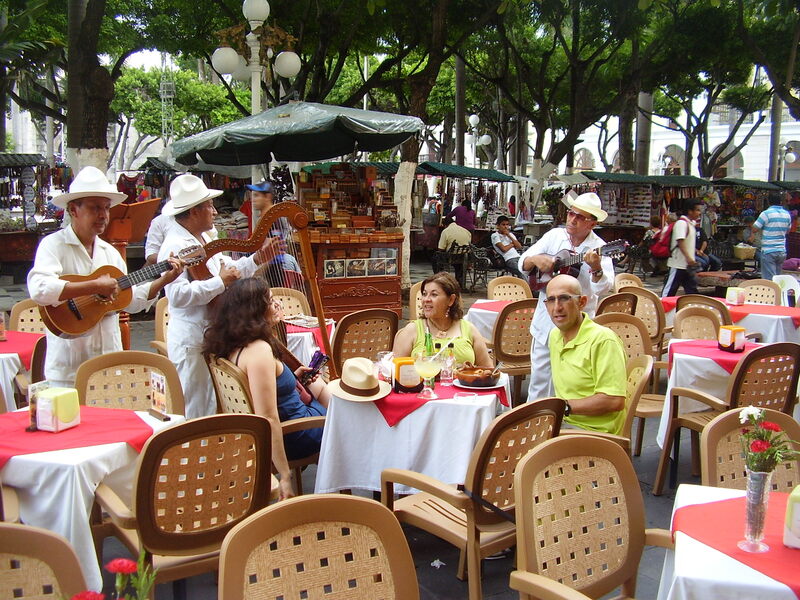 Afterwards we went to the beach-side restaurants adjacent to the aquarium where we ate mojarra en ajo (moe-har-ah en a-hoe; perch fried in garlic) and sang along with the jarocho trio playing there. From there we took a taxi to the nearby city of Boca del Rio (mouth of the river) and took a tour upriver to admire colonial ruins, modern mansions, and mangrove lagoons full of tiny red crabs. As evening fell we returned to the Plaza del Constitución, now aware that there was always something going on there. And we weren’t disappointed as the official municipal orchestra of Veracruz was there playing waltz-like music while a large group of well-dressed couples danced the Danzón, a graceful waltz with some Tango-like moves thrown in. A middle-aged couple promoting the event taught us some of the moves and all too soon the band packed up and left. No problem. 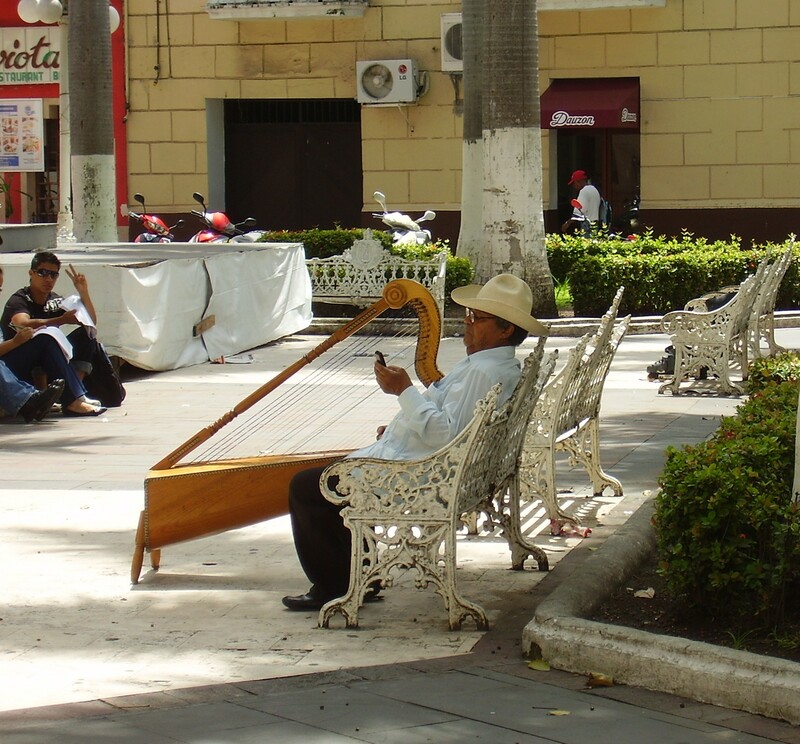 A short walk up a narrow side street brought us to the Plaza del Campana (plaza of the bell) where a hot, hot , hot Cuban salsa band had the crowd twirling and sweating to their irresistible beat. But the evening thunderstorms started in earnest, so we hightailed it back to our hotel for the night. 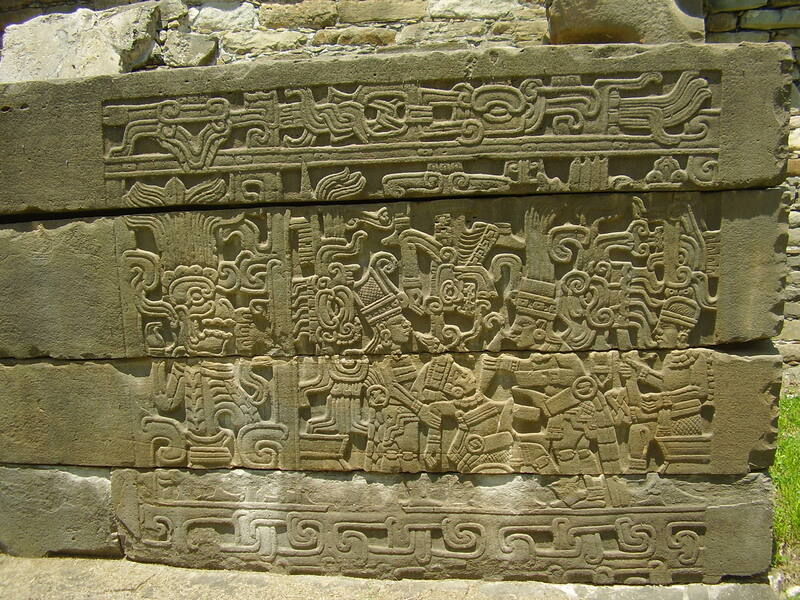 One of our goals for this trip was to visit the Huastec ruins of El Tajin (el tah-HEEN) near the small city of Papantla 200 kilomters (125 miiles) to the north of Veracruz. We found an independent tour agency inside the Holiday Inn by the harbor offering a day tour with car and driver for four people for about 3,000 pesos (about $250 for four people). Since we were traveling with another couple we split the cost between us and made the 2 ½ drive to the archeological site. 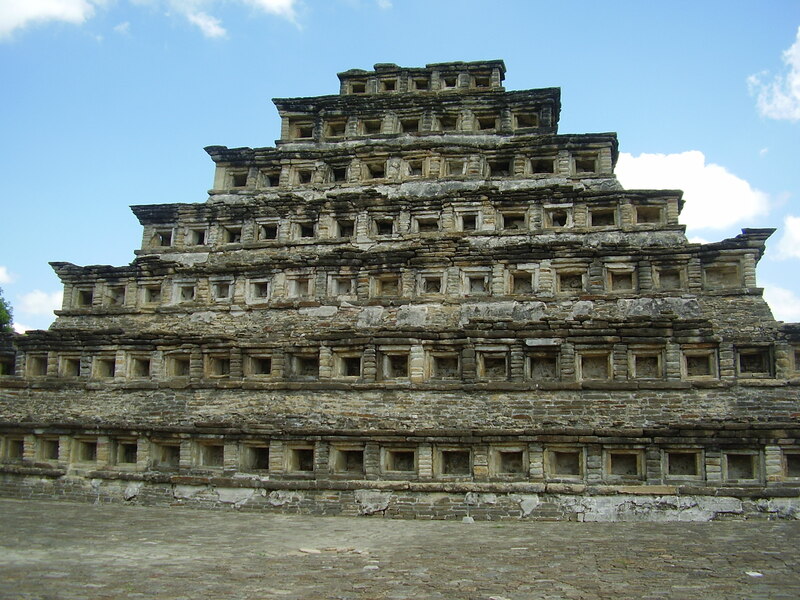 El Tajin is a magnificent and huge site with its pyramids, ballcourts and intricate relief carvings all set in the hilly jungle lands of Veracruz. 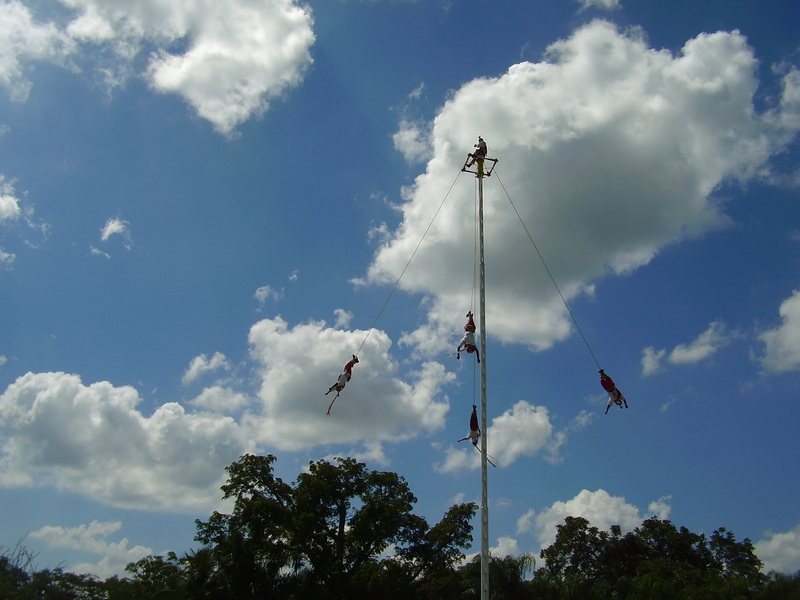 After touring the site we bought fresh vanilla beans from local vendors and watched a performance of the voladores (fliers) dangling from their 100 foot high pole by their legs as they whirled slowly back to earth while their captain played a flute from a perch on top of the pole. We finished the day by stopping at a beachside restaurant where we enjoyed seafood cocktails of shrimp and octopus. Time to say goodbye to the fun, but hot and humid Puerto de Veracruz. Next stop, the state capital Xalapa (hah-LA-pah), inland and high up in the cooler mountains. Xalapa (hah-LA-pah) sometimes spelled Jalapa) is the capital of the Mexican state of Veracruz which lies along the Gulf of Mexico. We had just arrived from the tropical port city of Veracruz (same name as the state) and felt refreshed by the cool, mountain air of Xalapa. This is because Xalapa is located inland and almost 5,000 feet (1,500 meters) up in the cloud forests of the Sierra Occidental (eastern mountain range). We checked into our hotel, El Posada Cafeto which we had reserved for 550 pesos/night ($45) and had an excellent lunch of grilled beef ribs and fresh juice at the Parilla de Beatrice downtown. 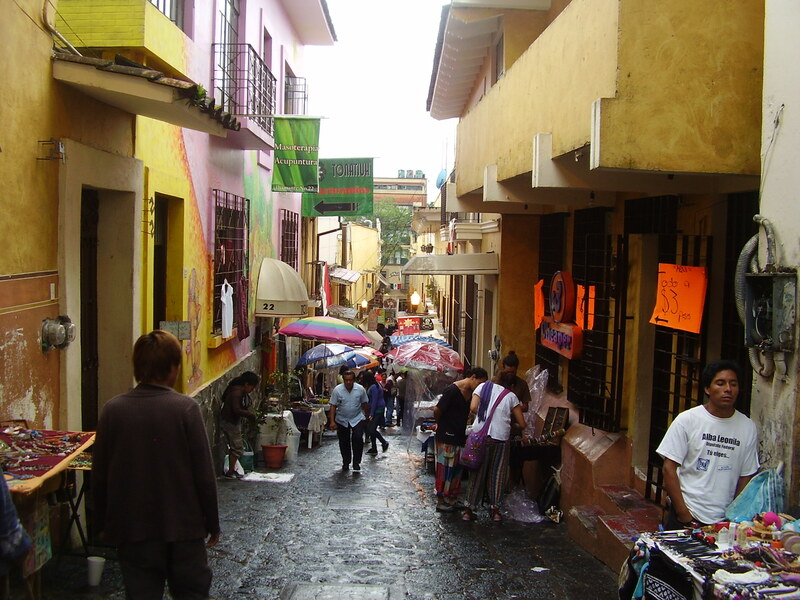 We walked off the heavy meal by going up the narrow, cobblestoned street Callejon de Diamante (the alleyway of diamonds). 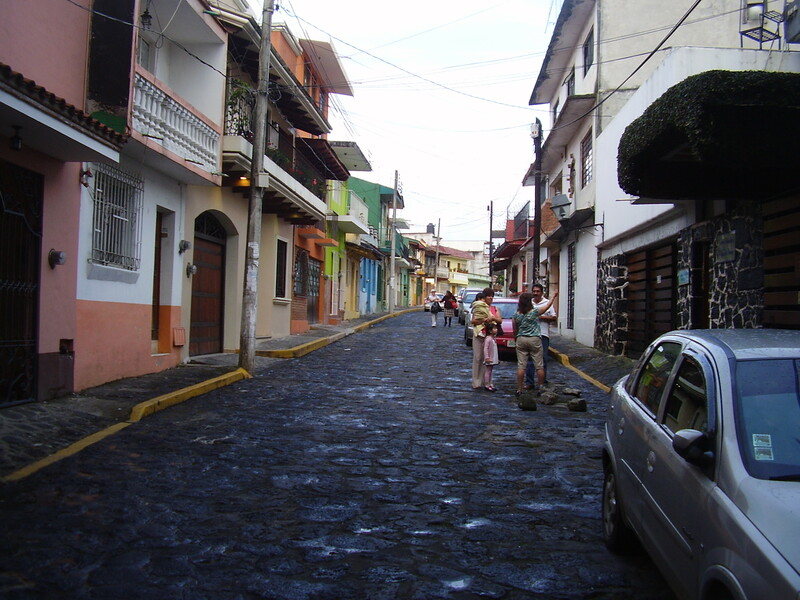 There are a number of these colonial era cobblestoned alleyways, or callejones, winding through the hilly downtown area, each with its own character. As evening fell we entered a club near the hotel, El Tantación (the temptation) and listened to a lively salsa band playing, but by now too tired to dance. By ten o’clock we were in bed. 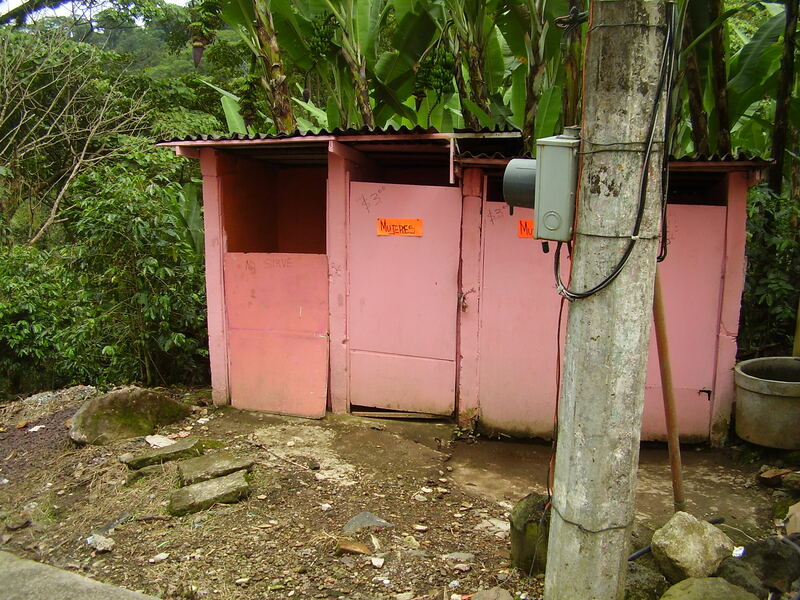 Next day we hired a taxi to take us to the nearby colonial town of Coatepec (kwa-tay-PEK), famous for its coffee which is grown in the surrounding hills. Coatepec is a colonial town that has been swallowed by the much larger city of Xalapa, but still retains its colonial character. We strolled around the town and had an excellent lunch of arrechera en salsa almendra (flank steak in almond sauce) at Tio YeYo’s restaurant along with coffee, of course, which was one of the best cups of joe I’ve ever had. After lunch we hailed another taxi to take us to the smaller colonial town of Xico (HEE-coe) 20 kilometers (12 miles) from Xalapa. We strolled around Xico where cowboys in their embossed rubber panchos were riding down the streets and entered a municipal plaza by the church where vendors were selling everything imaginable made from the coffee plant; coffee bean earrings, chocolate covered coffee beans. wreathes of coffee plant leaves. Then we noticed a building behind the church that appeared to be a museum of some sort. As we approached the women sitting in front welcomed us into their museo de vestidos Guadalupana (museum of dresses for the Virgin Mary). As it turns out, Xico hosts a grand parade during the major Mexican holiday, Dia de la Virgen de Guadalupe in December (day of the Virgin Mary). 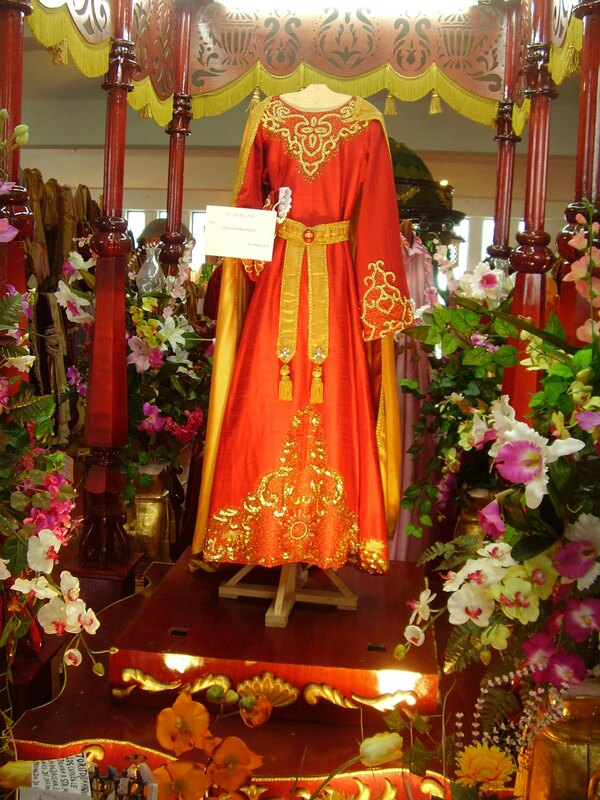 In this parade a likeness of the Virgin is carried in a procession down the main avenue and a family from the city is honored by being selected to make the dress worn by the Virgin on her journey. This museum is a collection of those dresses, handmade by local families over the past 100 years and they are overwhelmingly extravagant. We hail another cab and get driven out through the coffee plantations to the cascadas de Texcolol (waterfalls at Texcolo). 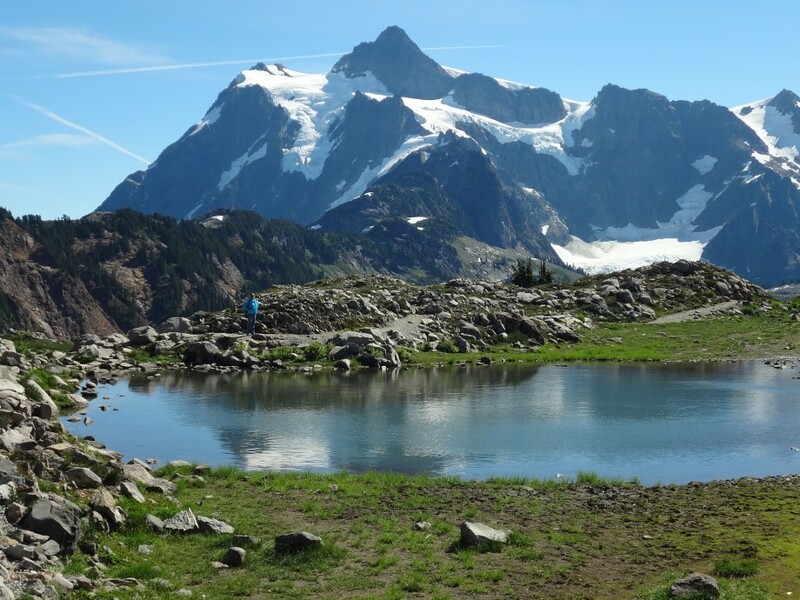 Here two mountain streams flow through deep gorges to form a magnificent waterfall. There are paths to hike around and tropical butterflies in purples, yellows and reds were flying around in large numbers. We returned to Xico ready for dinner, so we entered a likely looking restaurant, El Mesón Xiqueño and had one of the best meals I’ve had anywhere in Mexico. I had pollo en molé Xiqueño (chicken in mole sauce) and fresh made jamaica (hah-MY-kah; hibiscus tea) This meal was so good we bought a couple jars of their mole paste to bring home. Dinner for two cost us 256 pesos ($21), spendy by local standards, but cheap considering the quality. This has been a good day but we’re tired, so we took a taxi back in Xico where we hopped a local bus back to Xalapa. 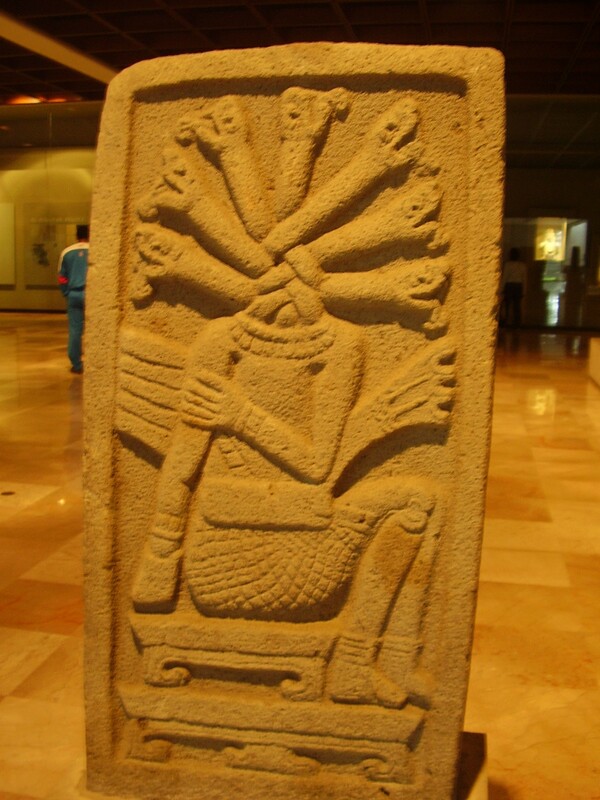 Xalapa is famous for its anthropological museum which focuses on the ancient and mysterious Olmec and Totonac cultures from the Gulf states of Mexico. The bright and modern museum is a short bus ride from downtown and it is well worth an afternoon to visit. 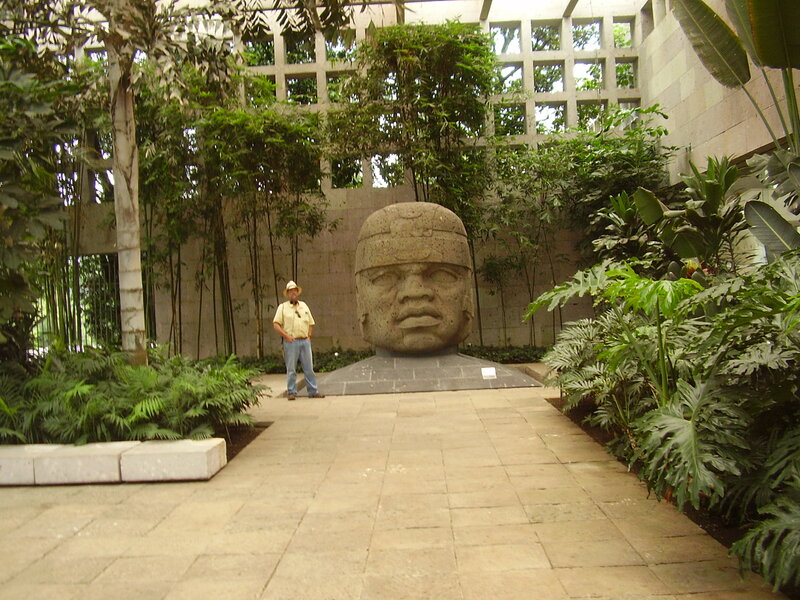 There are massive stone busts of Olmec heads, sections of walls from temples with their original brightly painted reliefs, and much, much more. We finish the day by strolling around town through the many parks and winding alleyways poking into shops selling locally made furniture and art. 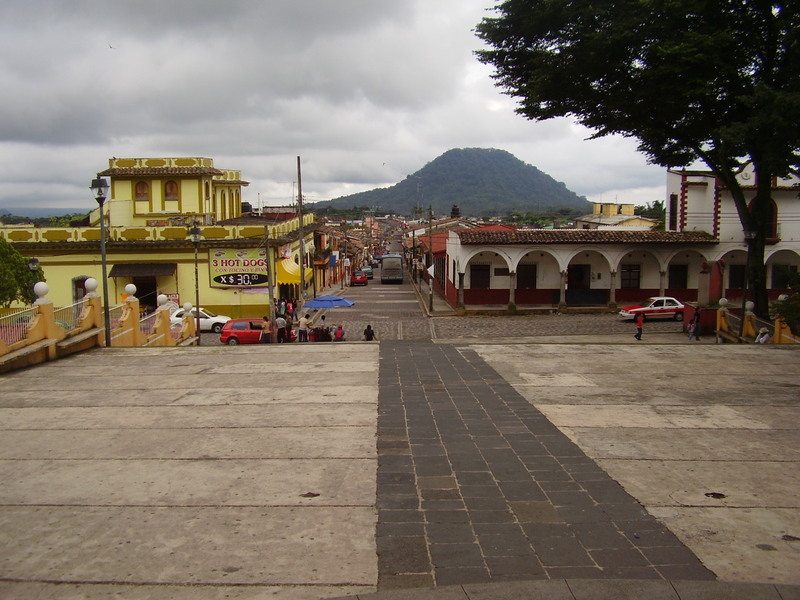 Our last day in Xalapa is a trip to the colonial town of Naolinco, 32 kilometers (20 miiles) away from Xalapa, but taking an hour and half to reach by bus since it is so high up in the cloud forested mountains. Naolinco is famous for the leather craftsmen there, but regardless, it was a delightful place with cobblestoned streets radiating away from a small central plaza. We walked directly to the main plaza from the tiny bus station and had an outstanding lunch at the Doña Josephina. As we walked up a side street we passed an old-fashioned apothecary with colored glass jars filled with herbal remedies. The owner hailed us in a heavy European Spanish accent. Smelling of rum he poked my belly, now full from our recent lunch, and prescribed an herbal tea to deflate it. Fortunately I lost it before I could try it. We said goodbye to our inebriated friend and walked down another narrow side street and saw a cobbler making very nice leather sandals. I bought a pair for 220 pesos ($18). Stopping at another shop I bought a particularly nice leather jacket for 1,500 pesos ($125). We returned to the main plaza and watched the high school marching band practice, the cacophony of their out-of-tune trumpets inescapable anywhere in town. After a dessert of mango paletas (ice cream sticks) we boarded the bus for the slow return to Xalapa and on to Mexico City for our flight back to Seattle.